In my teaching and therapeutic work, people express being surprised and in awe about the personal insights that come up during a period of extended spontaneous self-expression. Dedicating 10-20 minutes each day to expressive drawing will give you enough time to re-discover your spontaneity, and begin to discover your authentic drawing style. Try intuitive drawings, inner child drawing, or mandalas. 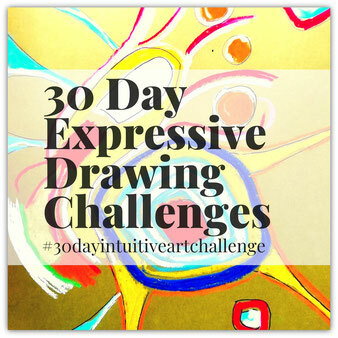 30 day self-directed expressive art challenges offer you a chance to try a modality of expressive drawing in a self-directed way. This is not an e-course. It is simply a challenge to show up in your sketchbook and create an expressive drawing every day for 30 days. 1. Number your sketchbook pages from 1-30. 2. Each day, for 30 days draw, create a spontaneous drawing. 3. Make notes of any insights that arise. 4. When you are finished, you are welcome but not required to write me (at shelley@expressiveartworkshops.com) with a few photos and a description of your process. You are also invited to share your process (anonymously if preferred) on my website as an inspiration for others. All three challenges are self-directed - they just require your inner commitment to show up on the page every day with a few drawing materials. Buy yourself a sketchbook that you will dedicate to your chosen creative commitment, and pick a modality to explore for 30 days. My hope for you is that after your 30 day creative commitment you carry on to fill an entire book expressive drawings. What will shift and change within you after 30 days of intuitive drawing? Who will you be? What will you find out about yourself?